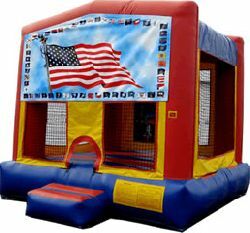 Celebrate America and the freedom to jump with the Flag bounce house rental. The flags of the states are displayed as a border around the American flag. If there is a more fun way to express your patriotism than a party inflatable rental, we'd like to hear it.